This post is regarding the phases of class loading in any java based application. I came across a very good write up material, and thought of sharing with all my blog users. The loading phase consists of locating the required class file (by searching though the respective classpaths) and loading in the bytecode. 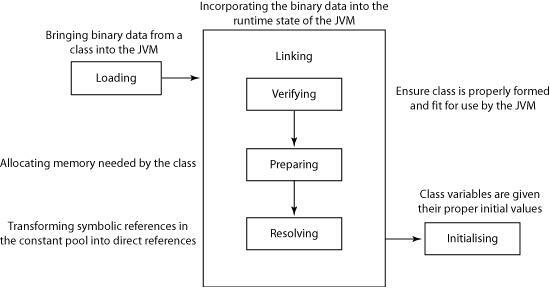 Within the JVM, the loading process gives a very basic memory structure to the class object. Methods, fields, and other referenced classes are not dealt with at this stage. As a result, the class is not usable. Bytecode verification. The class loader does a number of checks on the bytecodes of the class to ensure that it is well-formed and well-behaved. Class preparation. This stage prepares the necessary data structures that represent fields, methods, and implemented interfaces that are defined within each class. During the initializing phase, any static initializers contained within a class are executed. At the end of this phase, static fields are initialized to their default values. At the end of these three phases, a class is fully loaded and is ready for use. Note that class loading can be performed in a lazy manner and therefore some parts of the class loading process may be done on first use of the class rather than at load time.